Assuming you are purchasing a 3 bedroom executive condominium for $800,000. Eligible buyers may take up to an 80% mortgage loan if they suit the criteria ($640,000). Check the corresponding Repayment Amount based on the Interest Rate against the Loan Tenure you intend to take in the table above. Note that the figure is per $100,000 loan quantum. 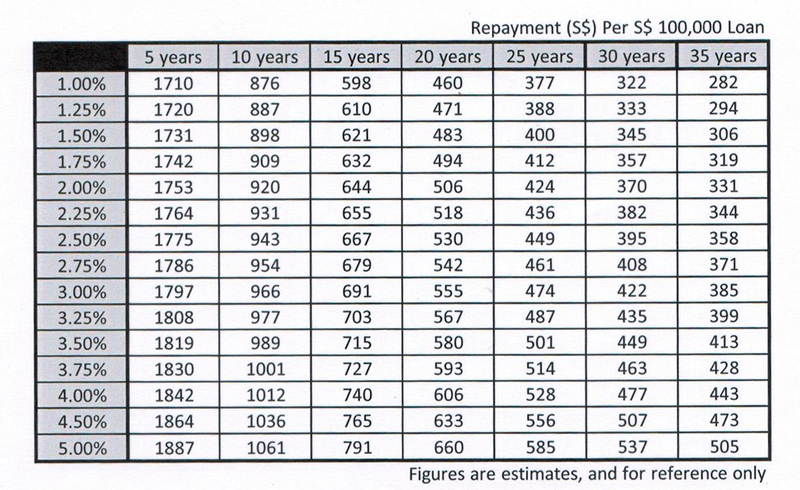 To calculate, simple take $640,000/$100,000 * $395 = $2,528 monthly repayment. Please note that the figures in the table are an estimate only. You should always contact a mortgage banker for detailed calculation on your loan eligibility, loan amount, current interest rate and monthly loan repayment.